I tried PROBAR for the first time at the beginning of last year. I got a package of the Orange BOLT Chews in my April/ May Runnerbox and was stoked to give them a go on my first ever 19 mile run (check out the recap here if you are interested). Later in the year I reached out to PROBAR to see if they would want to team up for a review and giveaway (it never hurts to ask, right?!). To my surprise, they were thrilled to work with a blogger like me ;) Obviously the giveaway is WAY closed by now, but you can still skim the review of the Bolt Energy Chews if you are interested in being #FueledByPROBAR like ME! Obviously I JUMPED at the opportunity! SIGN ME UP (I knew I better say YES before they change their mind about having me on their team :))! They are an awesome company with fabulous products and an even better mission behind the REAL FOOD! The AMAZING folks over at PROBAR wanted to make sure I knew what I was repping, so sent a HUGE care package! I mean REALLY BIG! Not only did I get #AllTheGoods, but YOU are in luck too! They sent me a coupon code for my friends, family and followers! 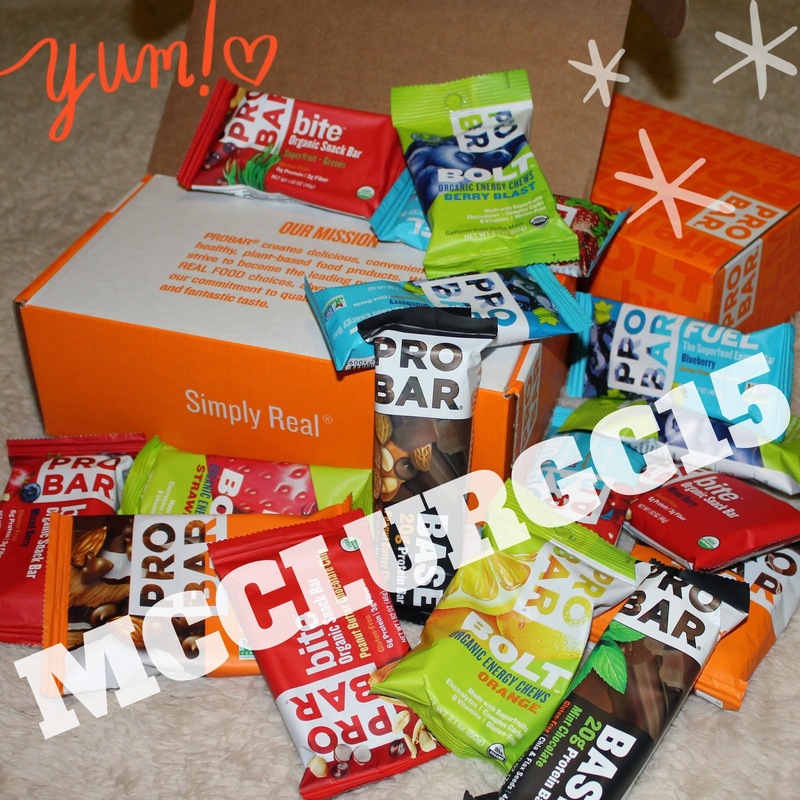 Use "MCCLURGC15" and save 15% off any purchases from the PROBAR Website (which includes individual products, variety packs and even the gear). PS This was more of just an "exciting announcement" type post. I am planning on doing a review of each product type over the next couple months (once I work through all of the delicious flavors, that is). Make sure to be on the look out for those in the coming weeks! Have you ever tired PROBAR? Keep us posted on how they are! 1) Do you like your garmins!? Both the tracker and the GPS. Which do you have and do you have any dislikes? 2) What training programs do you use for your races? 3) I ran a half last fall and am just getting back into running (I work A LOT of hours in the winter lol). Wondering how do you get and keep yourself motivated? !